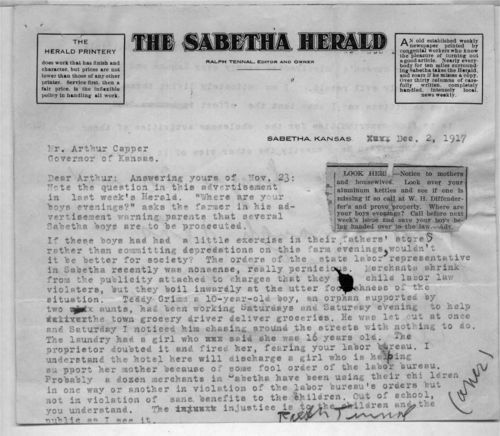 Ralph Tennal, editor of the Sabetha Herald, wrote this letter to the governor in an attempt to convince Capper that child labor laws did more trouble than good. Tennal believes that these laws prevented children from being industrious and led to crime, because "everybody knows what Satan does to idle hands." Instead of having children run loose, they should find suitable employment on weekends and evenings that would give them "wholesome activities." According to Tennal, these child labor laws were doing more harm than good. This strongly worded letter illustrates a common argument against child labor laws, and it would work well when paired with P. J. McBride's response dated December 8, 1917 (which has also been selected for this standard). It could be used within the classroom to discuss the pros and cons of child labor legislation. When combined with the other letters from Sabetha citizens, such as Roy Hennigh and Emma Grimm, this could form a case study of how this law was applied in small-town Kansas.